HVMN Ketone, the world's first ketone ester drink, is here. This launch is a technical and engineering breakthrough birthed from a unique collaboration between academia and Silicon Valley. It’s the culmination of 10+ years of research conducted at the University of Oxford and the National Institutes of Health and a multi-year effort of HVMN to deliver technology that pushes the possibilities of human performance. The human system is incredibly complex. It's arguably the most complicated "technology" in the known universe and the most valuable and precious technology that each of us will ever own. We live in an exciting time in history. 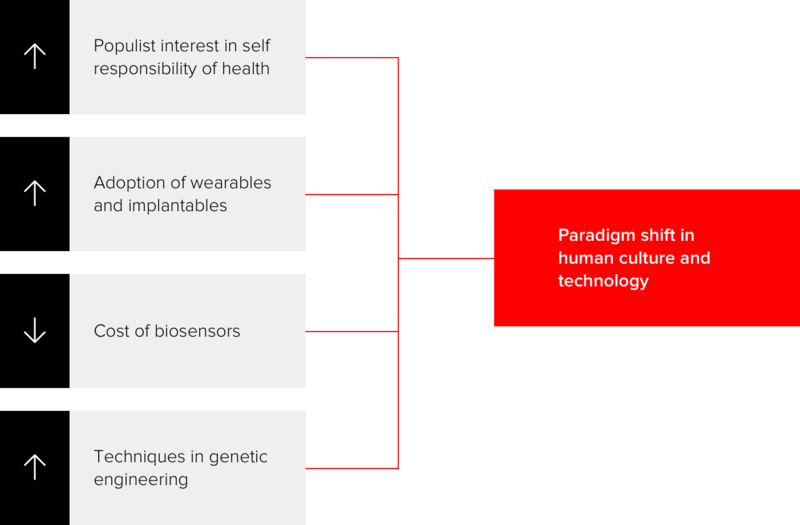 We have growing populist interest in taking responsibility over one’s own health, an increase in adoption and reduction of cost for mass-produced consumer wearables with medical-grade sensors, and we’re making leaps and bounds in biological engineering. These macro advances are the key driving forces that will enable our civilization to begin approaching the subtleties of human performance and ultimately allow us to optimize inputs into a human system to generate desired performance outputs. HVMN Ketone originated from a 2003-2004 era DARPA initiative to create a novel foodstuff to enhance warfighter performance during cognitively and physically demanding missions. The result of the initiative was the ΔG™ ketone ester technology, and it is now finally available to the world as HVMN Ketone. Numerous animal model and human studies have validated its safety and kinetics, and five separate gold-standard, randomized controlled trials conducted on elite cyclists published in an award-winning, peer-reviewed whitepaper in Cell Metabolism validated its real-world efficacy. In fact, world-class athletes have already battle tested HVMN Ketone in competition. Increased aerobic performance, reduced lactic acid production, and improved glycogen and protein resynthesis make HVMN Ketone an indispensable tool in any serious athlete's nutritional toolkit. However, the reader following the state of the art in ketosis and intermittent fasting will know that this is an incredibly exciting technical advance that has applications beyond sport. 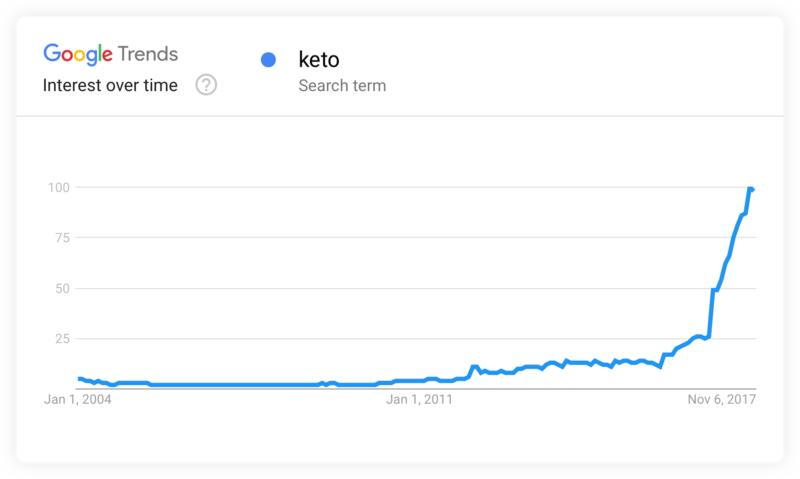 Interest in ketosis or keto in both academia and the general public is currently exploding exponentially. I ascribe this growth in interest to the inexorable wheel of academia slowly but steadily publishing more and more data suggesting that ketosis is a physiological state with potential for not only performance applications, but also use cases as part of a therapeutic strategy for some of the most pernicious health conditions facing our society today. The ability of HVMN Ketone to deliver on-demand blood ketone levels equivalent to 7-10 days of fasting or weeks of a ketogenic diet in a drink is a fundamental technological breakthrough. We hope to continue to play a role in the ongoing global research effort. I like to think of HVMN Ketone as the introduction of a "fourth macronutrient." We all know the three macronutrients: fats, carbohydrates, and proteins. They are the main three categories on a nutrition label that show caloric values and are the substrates that fuel metabolism. Ketones are a natural fuel source that our bodies create from fat when we run low on carbohydrates, and they're highly efficient. Until now, we've never been able to directly consume ketones as a food. Our end goal with ketone ester technologies is to make ketones broadly available to everyone, just like the other three macronutrients. Today, due to the difficulty and novelty of the manufacturing scale-up, HVMN Ketone is admittedly expensive. 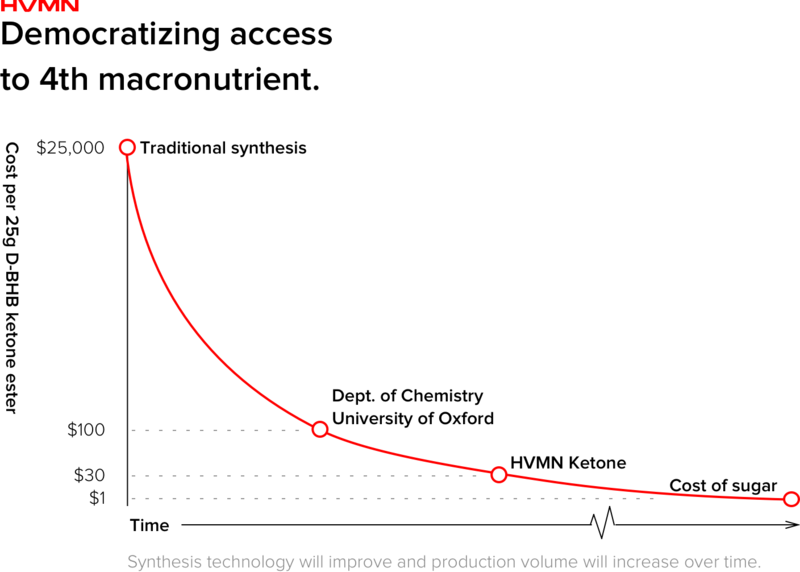 With traditional synthesis techniques, HVMN Ketone used to cost $25,000 per drink. In the initial studies and clinical trials, University of Oxford Department of Chemistry produced each drink on the lab bench at $100 per drink. We're proud to be able to introduce HVMN Ketone at approximately $30 per drink today. Our goal is continue to scale ketone ester production to $1 a drink in the future. The key components needed to make HVMN Ketone are organic compounds that can be fermented from sugar. Therefore, with enough scale and volume, the theoretical limit of cost should approach that of sugar. That is our goal. "Humans as a platform" was the initial rallying cry for HVMN when we started this company over 3 years ago. 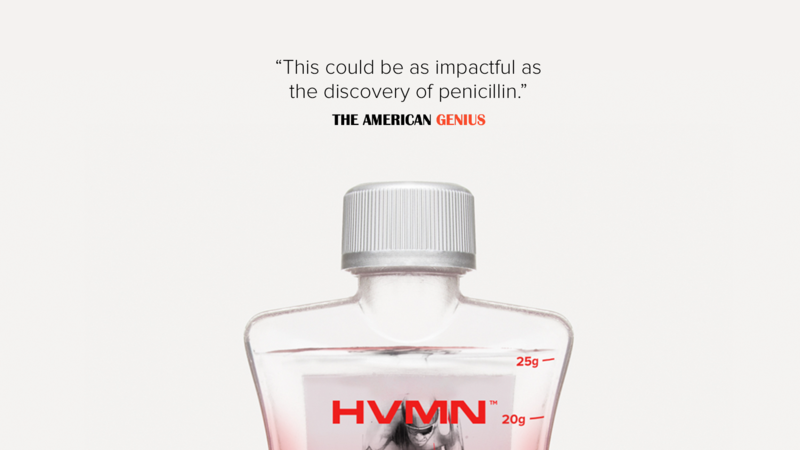 I'm so excited to introduce HVMN Ketone as a novel lever on the human platform.